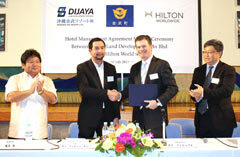 Guy Phillips of Hilton (third from left) and Dato Dickson Tan, Group Managing Director of Dijaya (second from left) signed the management agreement for the Hilton Okinawa Kin. At the Kin Town Central Community Center on July 30. Kin Town announced on July 30 that Hilton Worldwide, an American global hospitality company, will manage a large resort hotel at a site on the former U.S. military Gimbaru Training Area, which the U.S. military returned to Kin Town and other owners in July 2011. Kin Town Mayor Tsuyoshi Gibu made the announcement at the Central Community Center. Hilton and Malaysian property developer Dijaya Corporation Berhad held a ceremony in which they entered into a contract and the local government and Dijaya reached an agreement on the use of the site. The name of the new hotel will be Hilton Okinawa Kin. It will have nine floors above ground and 190 guestrooms. Hilton aims to start building in 2014 and to open in 2016. It will be the twelfth hotel that Hilton operates in Japan. Hilton already owns hotels in Naha and Chatan. The hotel in Chatan opens in 2014. Hilton will build the hotel on one of the five areas available for use on the site of what used to be the Gimbaru Training Area. Wanting to make the hotel prestigious by using the Hilton brand, Dijaya increased the budget for the project from 60 billion yen, the cost originally planned, to 80 billion yen. The town plans to build long-stay housing, condominium apartments and a large commercial complex containing stores selling local products in the second to fourth areas of the site. Dijaya will manage these buildings. The town has not yet decided who will manage the hotel to be built on the fifth area.